Dentists Dr. Lucian Kahan & Dr. David Stein are periodontists specializing in periodontics and dental implants with sedation available for your comfort. We are located in central Jersey in the Old Bridge and East Brunswick area. We offer a complete range of periodontal services. 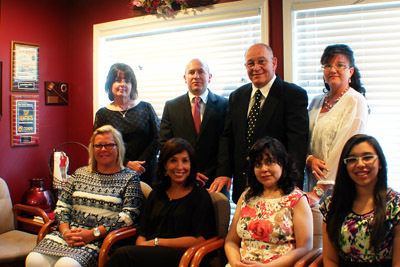 Our doctors and staff focus on making each patient's visit comfortable and pleasant. We offer nitrous oxide, conscious sedation, Oral and IV sedation. We invite you to tell us about ways we can make your visit more comfortable. Sedation dentistry, in general, is a technique used by a trained dentist to provide a relaxing and anxiety-free experience for people receiving dental treatment. The benefit of the sedation technique is that people often feel the procedure lasts only a few minutes when in fact, it might have taken hours to perform. You should not feel any discomfort during the procedure. Come read our latest articles!